Looking to increase the level of student thinking? Want to expose kids to authentic uses of information? Want the class to explore a problem from multiple points of view? Think Like A Disciplinarian (TLAD) is a method for teaching students to approach concepts from an expert’s point of view. This could mean thinking like a historian, biologist, or economist. Through TLAD, you can expose you class to new modes of thinking, teach subject–specific language, and develop questions that delve deeper into problems. As a bonus, you’ll introduce students to potential careers. In this article, we’ll focus on language arts and humanities. For students to think like disciplinarians, you don’t need to do an entire unit on the discipline itself. TLAD should be used to augment existing curriculum, not to create more curriculum. However, don’t just give your students a worksheet and expect them to gain much from simply filling it out. There is a balance between teaching the discipline and using the discipline as a tool. In the following example, I include famous examples of the discipline as part of my introduction. Make a plan, deciding which disciplines would be most useful for your class throughout the year and across subjects. I like psychologist and philosopher, for example, because they are applicable across literature and social studies. As you begin, introduce only one discipline at a time until the class is proficient in its use. Its better to start slowly than have to regroup your overwhelmed kids. To introduce academic disciplines, you’ll need to do some research without getting bogged down in unnecessary details. Wikipedia’s simplified articles work perfectly. David Chung, a high school Language Arts teacher, fuses Think Like A Disciplinarian with literature circles and posts his resources here. Finally, check out this huge list of academic disciplines to get your juices flowing. Now let’s introduce a discipline. We’ll use Think Like A Philosopher as our guinea pig. The first step is to establish the “big idea” of the discipline in a way that is appropriate to your students’ levels. The Google keyword “define” is perfect for tasks like this. 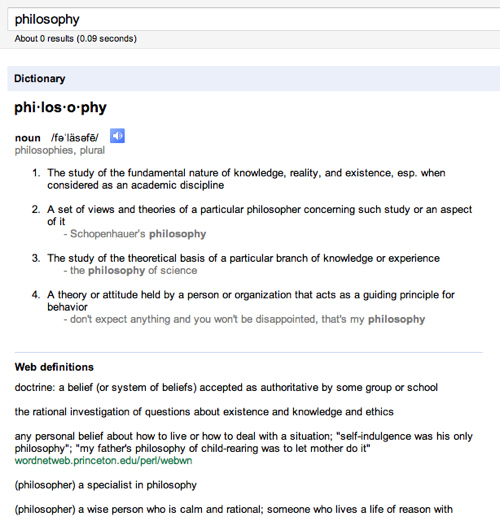 Type in define:philosophy as your search term, and Google will retrieve definitions from dozens of sources. As mentioned earlier, I also use Wikipedia’s simple article on philosophy to give me a focused definition. Does this truly encompass every facet of philosophy? Nope, but it’s a broad approximation that translates well to my students’ needs. It also makes application simple. After defining the big idea, consider the most essential words that this expert would use. This helps limit scope and target students’ thinking. We can then base our questions around these essential words. Again, don’t expect to fully express the nuances of a philosopher. Even a simplified version of the discipline will unlock new ways of thinking for your kids. This is a great place to expose students to classic ideas. 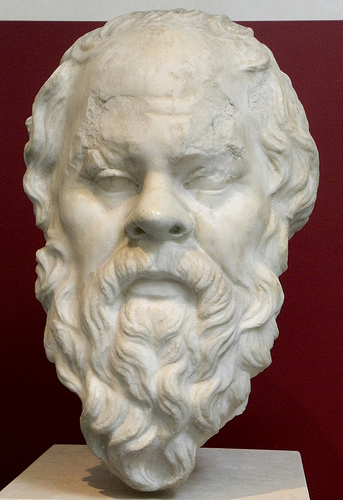 I would present Socrates and Confucius as famous examples of philosophers. More importantly, introduce some simple philosophies that students can refer to while they Think Like A Philosopher. Altruism: Living life focused on helping others at the expense of one’s needs. Egoism: Living life focused on helping one’s needs at the expense of others’. Authoritarianism: A belief that individuals should submit to an authority, such as the government. Anarchism: A belief that there should be no authorities. Optimism: A belief that emphasizes the positive side of life. Pessimism: A belief that emphasizes the negative side of life. I used Wikipedia’s list of philosophies as a starting point. Now we’re going to use the language and famous examples to develop a series of focused questions. The amount of scaffolding will depend on your students’ age and familiarity with the discipline, but I like to keep it very focused at first. Shape your questions to gradually move towards more complex thinking. Finally, integrate depth, complexity, and content imperatives into questions as appropriate. Here’s a sample progression for analyzing a character or historical figure like a philosopher. Does this person interact with others in a positive or negative way? Give an example of this interaction. From this interaction, form an ethical rule that this person might live by. Based on this rule, identify a philosophy that this person might subscribe to. How does this person’s rules for life parallel or go against your own ethical beliefs? Note the progression: we move increasingly abstract and then finally connect to the student’s own life. I use a concentric circle graphic organizer, as written about by [Sandra Kaplan here (pdf)ttps://web.archive.org/web/20111122025738/http://www.txgifted.org/files/tempo/2002-2.pdf) for students to work towards the final question. 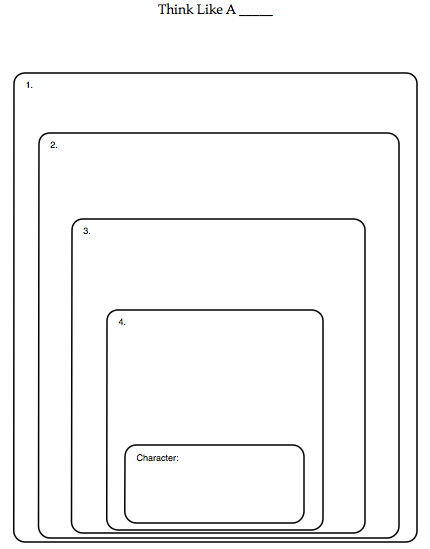 This graphic organizer is a scaffold, not a final product. If we’re asking students to think like an expert, we should also allow them to produce something utilizing this new level of understanding. Students debate the wisdom of characters’ philosophies. Students write historical fiction in which a historical figure has changed their philosophy. The beginning of the year is a great time to introduce your students to a handful of disciplines that will serve them throughout the year. Feel free to also use these tools as a differentiated learning activity for students who test–out of grade–level work. Finally, it is a great idea to group students and have each analyze a character from a different disciplinarian’s point of view.